The Brutus models offer a 24 hp diesel engine with hydrostatic transmission. A treadle pedal allows travel in forward or reverse without shifting gears. The vehicles provide 6 inches of suspension travel that, when combined with on-demand all-wheel drive, allows for safer and more comfortable transportation of passengers and cargo over virtually any terrain. 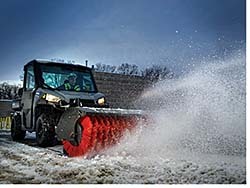 The vehicles are the first side-by-side utility vehicles that use a multi-link coil over De-Dion rear suspension to deliver superior ride quality for commercial work applications.